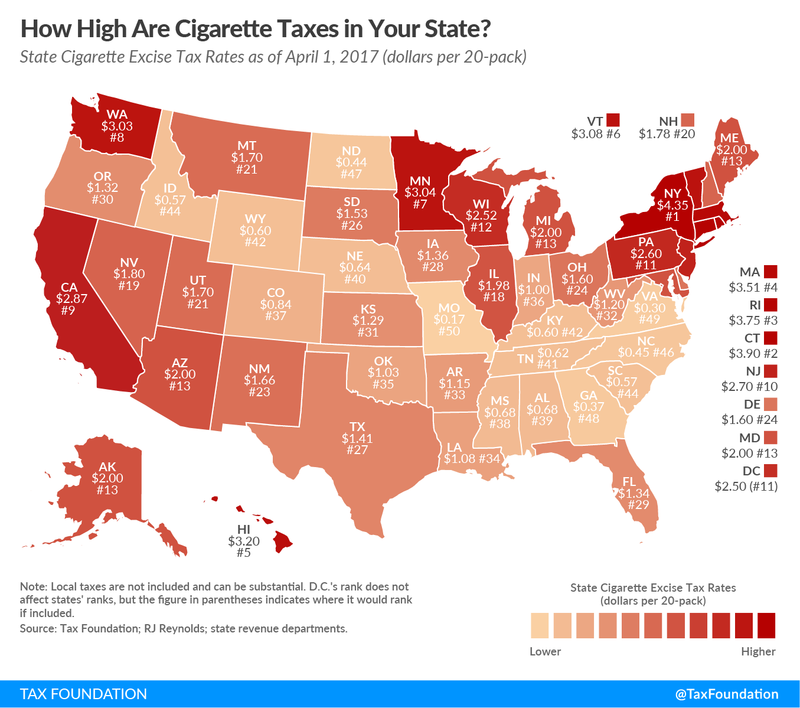 For this week’s map, we look at state cigarette tax rates across the country, which are levied on top of the $1.0066 federal rate per 20-pack of cigarettes. As of 2014, taxes accounted for almost half of the retail cost of a pack of cigarettes. Related: How Stable is Hawaii Cigarette Tax Revenue? The average state tax rate is $1.68 per pack. New York, however, remains in the top spot with the highest state rate in the country at $4.35 per pack. Connecticut ($3.90), Rhode Island ($3.75), and Massachusetts ($3.51) follow closely behind. There is wide variation in cigarette tax rates – Missouri, for instance, levies the lowest tax in the country at $0.17. Virginia ($0.30), Georgia ($0.37), North Dakota ($0.44), and North Carolina ($0.45) levy similarly low rates. Not included in this map but important to remember is that local cigarette taxes also apply in some states. In Chicago, combined state, county, and city taxes add $6.16 to the price of a pack of cigarettes. In New York City, smokers pay $5.85 in taxes alone on a pack of cigarettes. Cigarette taxes are sometimes touted as a fix for large, structural problems when states face revenue shortfalls. However, cigarette tax revenue is declining as fewer Americans smoke, meaning cigarette tax revenue is not a reliable funding source for important policy priorities. To illustrate this point, we have built an interactive web tool that allows taxpayers to see how cigarette tax revenues have changed since 1955. Revenues can also suffer from intrastate cigarette smuggling, which we’ve covered extensively. Broad-based, low-rate taxes are the proper way to correct structural problems in a state’s tax code, not high rates on already narrow bases.